Brutus has a home! 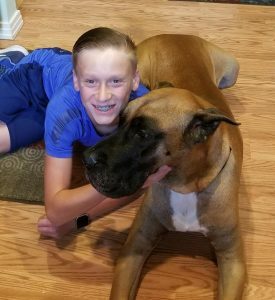 - Rocky Mountain Great Dane Rescue, Inc.
Brutus has a home with his foster family in Parker CO! Jeremy and Kelly fell in love with Brutus instantly, and knew very early on that Brutus had found his forever home with them! Their son Jackson loves to walk Brutus around their neighborhood, and is excited to bring him to some of his little league baseball games. The family enjoys spending time outside, and plans to take Brutus everywhere they go. Jeremy mostly works from home, and Brutus is enjoying having someone with him during the day. He is getting all the love and attention he deserves! Way to go sweet boy!